A better understanding of our clients' tastes enables us to more clearly envision what they need within their homes. 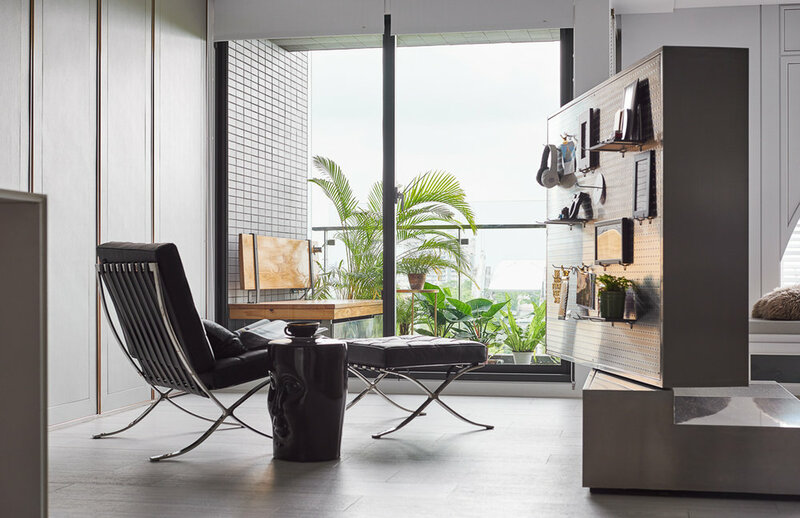 In this particular case, the client, who yearned to live in a home with an expansive park view, contacted us during the pre-sale stage of an apartment in a new building to be constructed in the city of Pingtung and requested assistance for the design of their home. Mr. and Mrs. Hsu are very fond of the classic style, while their children prefer simple yet stylish decor. We endeavored to find middle ground by taking into account the different needs of each individual so as to formulate an all-encompassing design. This was how we proceeded: we started by identifying the apartment's strength, which is the beautiful park scenery just outside the window, and we considered how the Hsu family would enjoy it from all angles of their home. At the same time we attempted to fulfill everybody's needs in terms of their preferences for style. Even though the "classic style" is typically associated with the complex and resplendent, we selected the spectacular view outside the window as our point of departure and gradually veered toward the decision to leave the entire interior space "blank." That is to say, we proposed to create an environment of serenity and comfort by employing pure white as the primary backdrop. To elegantly exhibit aspects of classical design, we utilized symbolic elements and simplified the complex lines by interpreting classical beauty with a modern approach. We chose white as the background color of the living room wall, to which we added European-style cornices. The original black window frames were replaced by round, arched windows in order to soften the space and to form a visual reference. We strategically arranged the placement of the dining table, lamps, sofas, all the way to the window seat, in a way so that they form a visual continuity extending toward the scenery outside the window. In the original layout of the apartment, the kitchen faced south; we altered the floor plan by creating an open space combining the kitchen with the living room. We additionally installed a kitchen island to facilitate the preparation of cooking ingredients. In consideration of Mrs. Hsu's baking interests, we also designed a simple yet spacious cabinet, which not only provides ample storage but moreover adds a touch of elegance to the overall environment. With respect to the north side of the apartment facing the window, we designed a personal space for Mr. Hsu that accommodates his reading needs and his habits of watching TV and listening to music.We defined the space of the "study" using a heavyweight armchair and designed a stainless steel TV wall which automatically rotates 360°and a side section that provides storage for headphones, magazines and other beloved objects. Thanks to the chair with a foot bath we purposefully installed, Mr. Hsu will be able to fulfill his dreams of enjoying the scenery inside of the small adjacent balcony without suffering from the winter cold. The common family space, which begins with the pleasant external scenery, is designed so that each individual may focus on their preferred pastimes yet at the same time interact and communicate with each other within an open space. Their bedrooms in turn serve as private enclosures each designed in their favorite styles. The master bedroom is a continuation of the white tonal backgrounds of the living room. The wooded floor however is tinted several shades darker to give warmth to the room. On the back wall of the bed and on the ceiling, we designed symbolic natural "leaf vein" patterns to resonate with the greenery outside the window and to mitigate the weight and presence of the low beams. For the bathroom, we decided on a combination of white stones and tiles with detailed embellishments such as lighting and metal trimming to accomplish an eclectic mix of casual and classical. 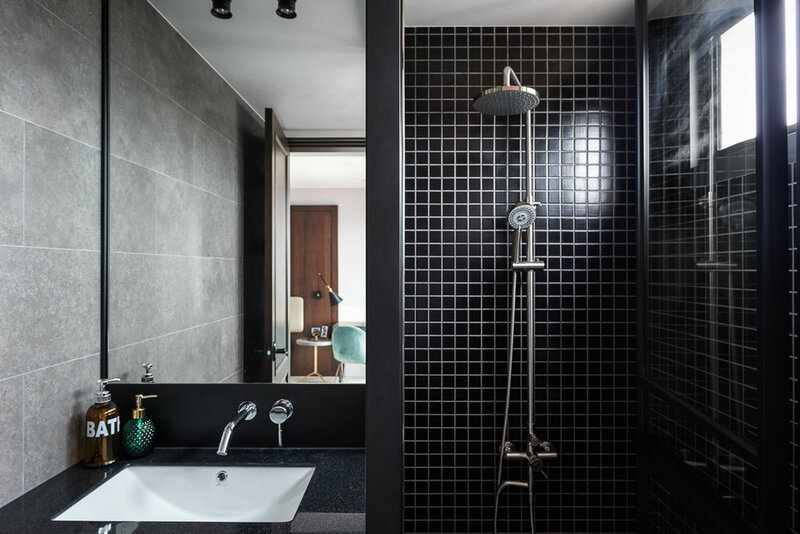 As for the two secondary bedrooms, we proceeded according to the children's unique personalities, which is why each door seems to lead into a distinctively furnished boutique hotel room. The boy's room, furnished with leather and metal ornaments, manifests the staunch, virile and resolute character of a young man who is still somewhat introverted. The girl's room on the other hand emits an ambiance of casual coziness with its cement textured backdrop and matching designer furniture. All of this ultimately culminates in a home in which each individual is able to locate their preferred space and place for comfort and contemplation.